Learn to draw Buddhas using traditional eastern techniques, and leave with your own Buddha painting at the end of the weekend. Beginner through experienced artists are welcome. Workshops focus on either Medicine Buddha or Shakyamuni Buddha. Shakyamuni Buddha is the historical Buddha. At the time of his enlightenment he is said to have touched his hand to the ground and called the earth to witness. Shakyamuni holds a begging bowl and wears Nirmanakaya robes (without adornment). Medicine Buddha is the healing Buddha. He is blue in color and holds a medicine plant in his right hand and a begging bowl with a medicine flower in his left hand. He is seated on a lion throne. He wears Nirmanakaya robes (without adornment) as still worn by Tibetan Buddhist monks today. Medicine Buddha practice helps cure physical, mental, and emotional illness. Author of “Drawing Buddhas and Bodhisattvas, “a how to” guide to traditional Tibetan style of drawing. I studied Tibetan Thankga painting at Naropa University in Boulder, CO and under the guidance of Khen Rinpoche, his brother Khenpo Tsewang Dongyal and the Drikung Skaybgon Chetsang. I attended Montserrat School of Visual Arts in Beverly, Massachusetts and then pursued a career as a chef, edible art. I have published three cookbooks and a novel, Rudi and the Green Apple. My new direction is to fuse two disciplines and add local flavor. 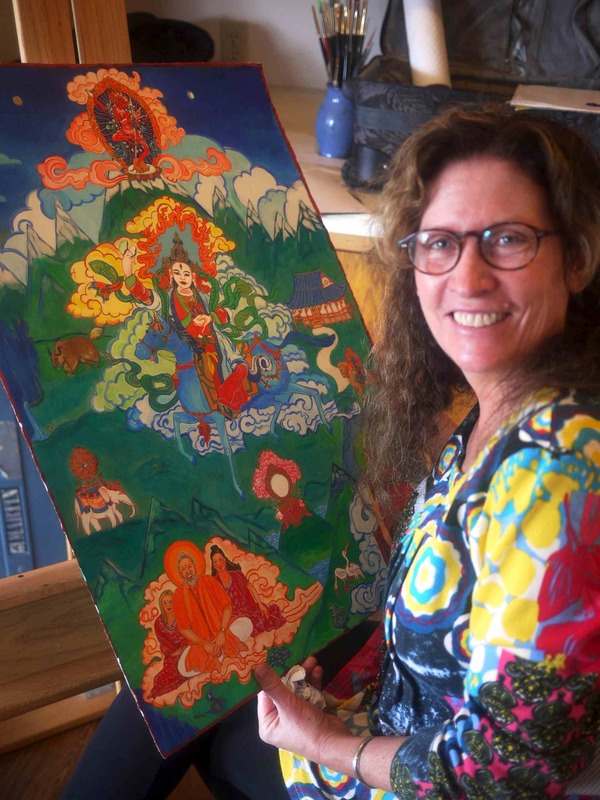 My background is drawing and painting traditional Tibetan thangkas, Buddhist scroll paintings. I am merging that with the practice of traditional Japanese woodblock prints, mokuhanga. Then, I add local landscape especially from Hawaii and Colorado where I spend most of my time. My goal is acknowledge a new art movement, that of American Buddhist Art. I honor the traditions of the past while making the artwork uniquely from a Western perspective. I believe the real joy of carving and painting Buddhas, Bodhisattvas and Hindu deities is the idea of creating a space for the Buddha or deity to reside. The attitude is that once the painting is finished – The Buddha or Tara or Ganesha move in. My woodblocks and paintings are held in private collections in the mainland, Hawaii, Europe and India. I was an award winning middle and high school art teacher in Kona, Hawaii and Boulder, Colorado. 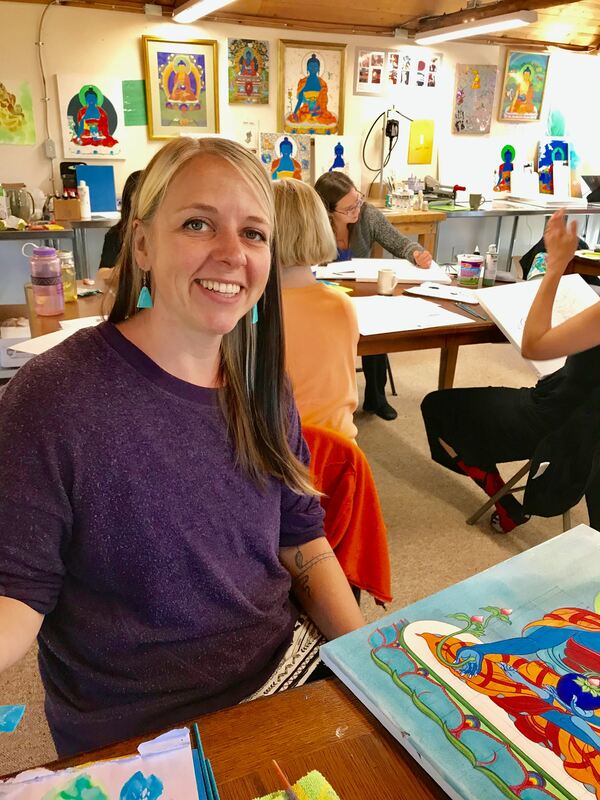 I am the director of Eldorado Yoga summer camp in Eldorado Springs, CO.
studied studio art at Colorado State University, and then moved to Shoshoni Yoga Retreat in the mountains of Colorado. 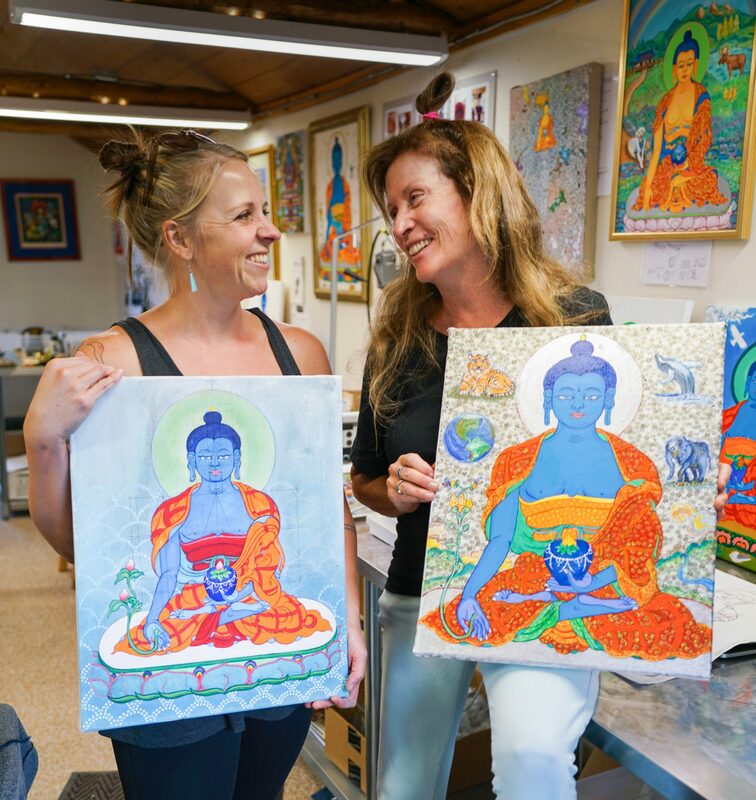 There she deepened her understanding of Buddhist thangka painting, studying with artists Karma Phuntsok and Faith Stone. 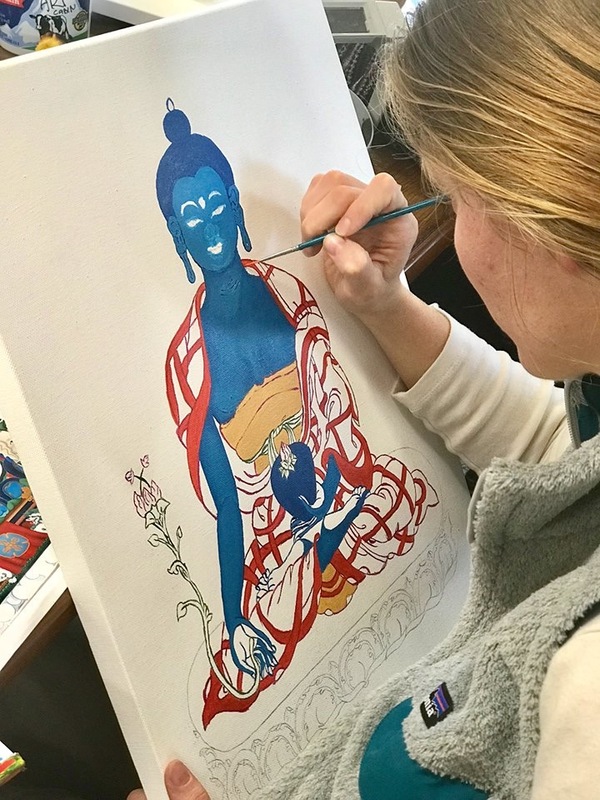 Her work is an expression of her deep connection and love for yogic (Tibetan and Hindu) practices, teachings and traditions. 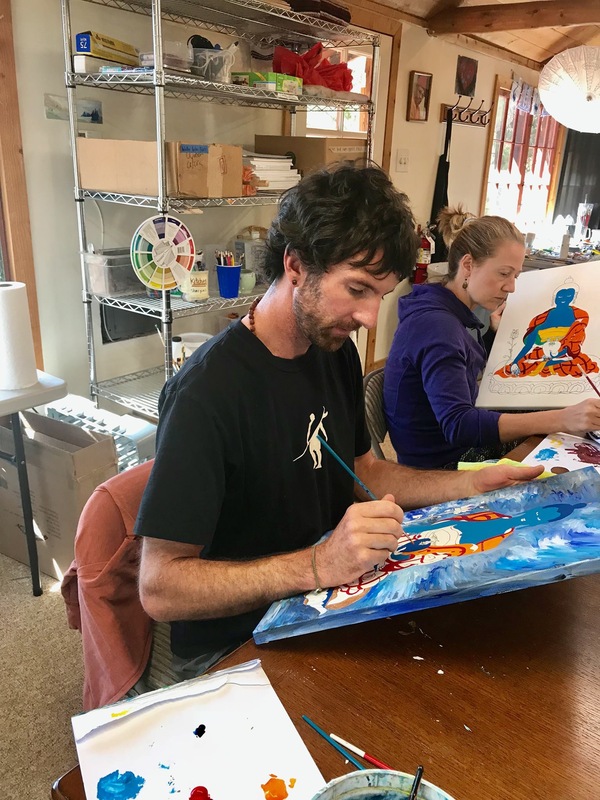 For the last decade, she has worked and exhibited across the Front Range region of Colorado. Her paintings and limited-edition fine art prints are collected internationally. I have never considered myself an artist, and am even intimidated by coloring or simple crafts at times. But this workshop made art so accessible and fun! It was inspiring see so many people with all different levels of experience bring a Buddha to life by the end of the weekend. The teachers were knowledgable, encouraging, and super helpful. I’m hoping to take this workshop again in the future!